Beloved for their vintage inspired style, the appeal of a Panerai is undeniable. This is particularly true when the brand makes tribute watches to reflect models from their archives. Here we dive into the details of the Panerai Radiomir PAM 448, which pays homage to a milestone vintage model. 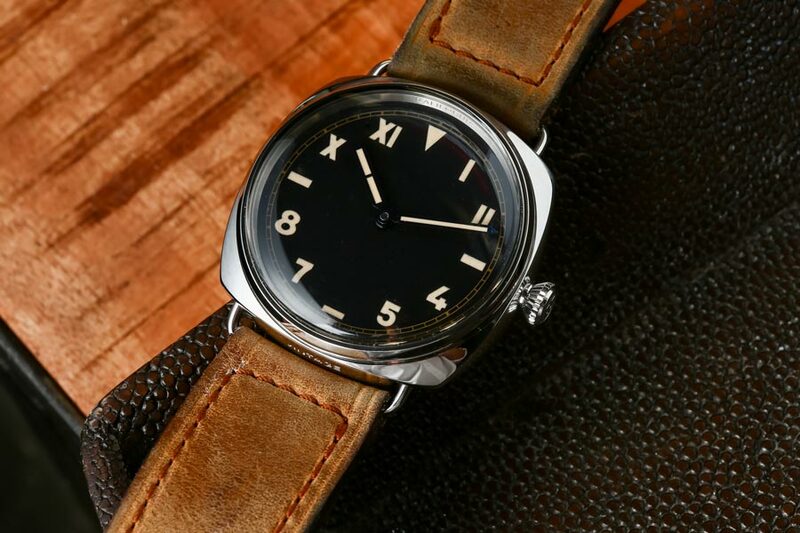 The California PAM 448 is a unique watch for various qualities. Panerai is an internationally renowned luxury watch brand, but before it was well known it was a supplier for the Regia Marina or Italy’s Royal Navy. As an official military supplier, Panerai was charged with producing timekeeping instruments for the Italian Frogmen. Thus, not only did Panerai watches have to water resistant, they needed to be highly legible in murky waters too. In order to do this, Panerai actually turned to the leaders in water resistant watches—Rolex. And, together, Rolex and Panerai developed very large 47mm water resistant watches with incredible luminescence. Panerai watches have to water resistant, they needed to be highly legible in murky waters too. 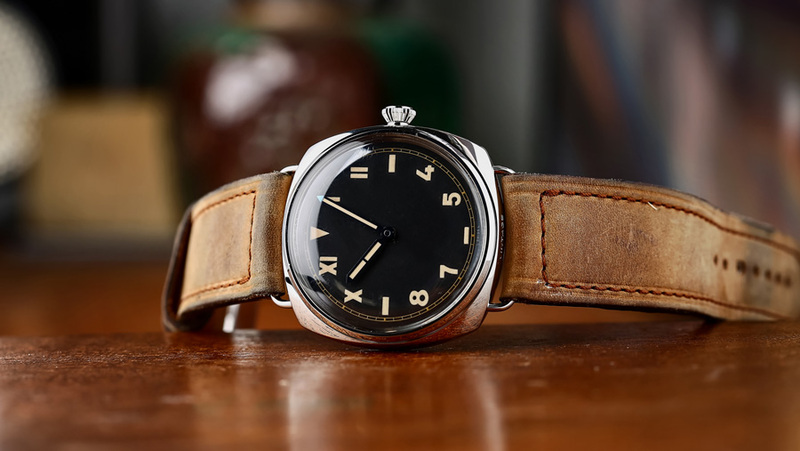 Panerai produced ten prototypes of the first Radiomir watches in 1936, thus, cementing Panerai’s relationship with the Navy. 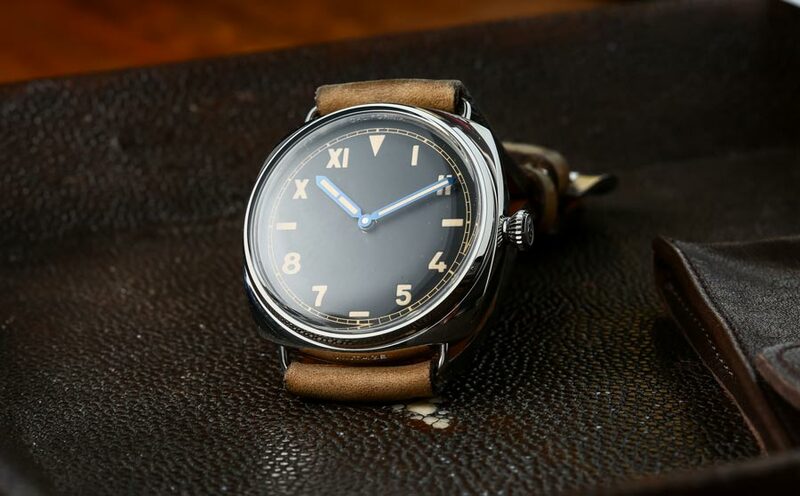 The official production of the military issue Panerai Radiomir began two years later, in 1938, which included some enhances and modifications. In 2012, Panerai unveiled the Radiomir California 3 Days PAM00448 limited to only 750 pieces. A tribute reference, the PAM 448 is a clear nod to the historical 1930s Panerai model. The immense 47mm stainless steel case houses the same so-called California dial from 1936. A California dial is an Art Deco style layout that includes Arabic and Roman numerals in addition to stick indexes and an inverted triangle at 12 o’clock. Also on the dial are the distinct blue-outline center hands similar to the original Radiomir. Protecting the face of the watch is in fact thick Plexiglas crystal rather than the ubiquitous sapphire crystal. From this angle, you can see the blue outlines on the hands. Emphasizing the homage, Panerai engraved “VINTAGE” in the middle of the strap attachments at 6 o’clock. On the opposite side at 12 o’clock, “CALIFORNIA” is engraved on the rehaut. The Panerai-patented detachable wire loop attachments allow for very easy strap switching—perfect for those who like to often change the look of their watch. The word “CALIFORNIA” is engraved in the watch. While Rolex movements powered early Radiomir models, today, Panerai have their own watchmaking facilities in Switzerland. Driving the Radiomir California 3 Days PAM00448 is the P.3000 Caliber. The same movement in the Panerai Radiomir Composite. 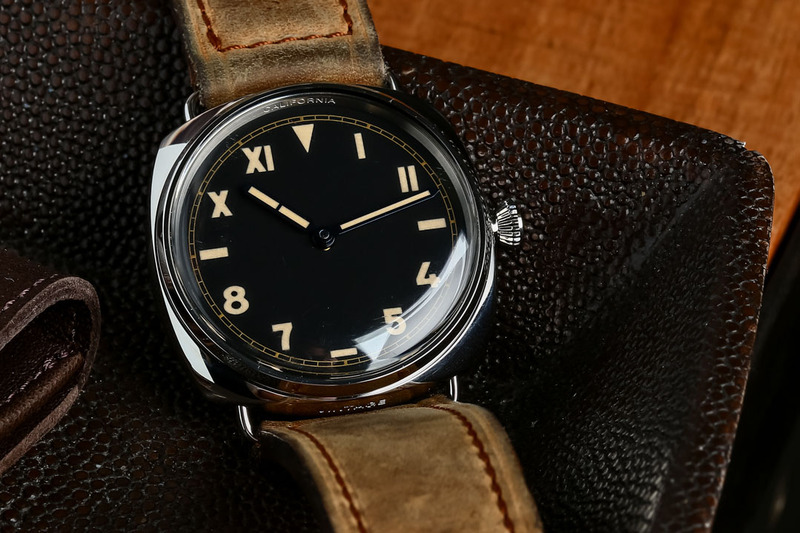 The California PAM 448 shares the same movement as the Panerai Radiomir Composite. Produced at the Panerai Manufacture, the P.3000 Caliber manual-wound mechanical movement includes 21 jewels and 160 components. The movement operates at 21,600 beats per hour (3 Hz) and provides a three-day power reserve thanks to two barrels. 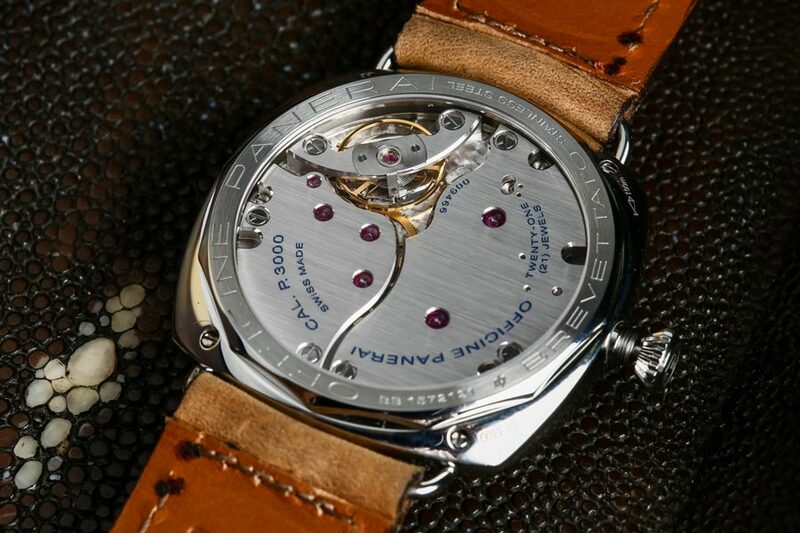 The beauty of the caliber’s construction can be admired via the large transparent caseback. Naturally, since the origins of the Panerai Radiomir began as a dive watch, the PAM 448 is water resistant to 330 feet (100 meters). This Panerai uses the P.3000 which makes timekeeping a breeze. Celebrating a historic moment in Panerai’s history, the modern Radiomir California 3 Days PAM00448 is a fitting tribute. What’s more, since this is a limited edition piece, owning one is without a doubt a special treat. What are your thoughts on this tribute Panerai? Some dislike the California style dial, while watch review sites love it. Would you wear a 47mm watch? Let us know in the comments section below.